Monday was a key day in Brexit negotiations. The UK and the EU were said to be close to agreement on overcoming obstacles to moving on to trade talks. 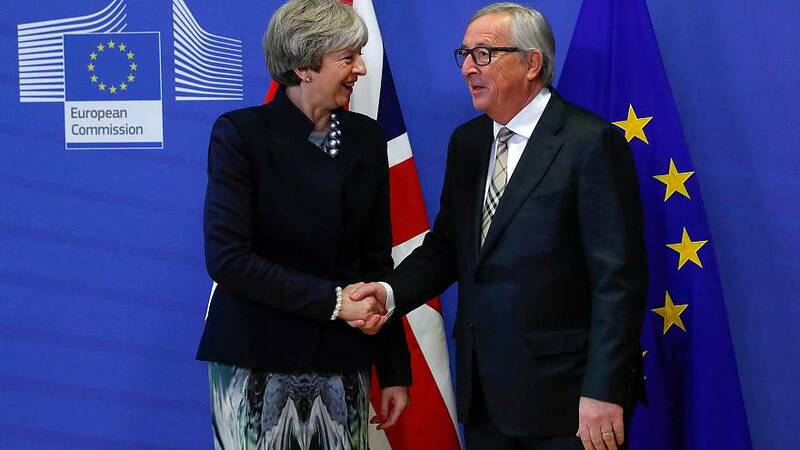 However, after meetings in Brussels, European Commission President Jean-Claude Juncker and British Prime Minister Theresa May said no deal had yet been struck. Both sides need to make "sufficient progress" on the rights of citizens, a financial settlement and the Irish border before talks can progress to trade and the UK's future with the bloc. A key sticking point has been the border between the Republic and Northern Ireland. May needs to convince the EU she has a plan that will work for the Irish government which wants written guarantees that there will not be a hard border. Around lunchtime reports began circulating that a breakthrough was in prospect. Media reports quoted a draft negotiating text, under which Britain and the EU would commit to "continued regulatory alignment" between Ireland and Northern Ireland after Brexit - a form of wording seen as potentially acceptable to all sides. European Council President Donald Tusk, who cancelled a planned midweek trip to the Middle East to attend more Brexit talks, said on Twitter that he was "encouraged" after speaking by phone with the Irish prime minister. "Getting closer to sufficient progress", he said. Earlier reports said that progress had been made over the weekend and that the two sides were close to breaking the deadlock – although campaigners for the future rights of EU citizens in the UK fear that resolving key concerns may be pushed back to a later stage. Irish officials were quoted as saying that agreement was still some way off, although “intensive contacts” were continuing. As the Irish Cabinet met on Monday morning, reports said government sources were pessimistic at a deal being reached – in contrast to optimistic accounts from EU sources. Irish Prime Minister Leo Varadkar said he would make a statement on phase one of the Brexit talks later on Monday. A news conference scheduled for early afternoon was then delayed. Arlene Foster, leader of the Democratic Unionist Party (DUP) on whose support the UK government depends, said Brexit must leave Northern Ireland on the same terms as the rest of the UK. "We will not accept any form of regulatory divergence which separates Northern Ireland economically or politically from the rest of the United Kingdom," she said, noting the "speculation" emanating from Brussels. The reports brought a sceptical response from Scotland and London, both areas which voted to remain in the EU in last year's referendum. Scotland's First Minister Nicola Sturgeon said that if Northern Ireland could keep "regulatory alignment", with the EU then other parts of the UK could do the same. London's Mayor Sadiq Khan also suggested the UK capital could seek a similar deal. With the UK set to leave the EU’s Single Market and Customs Union, the prospect of different regulatory standards in the future has put the Irish border in sharp focus. No party wants a return to a “hard border” which could hurt both countries’ economies and potentially revive historical tensions. Dublin wants Northern Ireland to be granted special status to avoid “regulatory divergence” between the North and the Republic. However, Unionist politicians in the North and in mainland Britain reject any move which would loosen Northern Ireland’s ties to the rest of the UK. Last week another of the main obstacles to progress in the Brexit talks appeared to have been largely overcome, when the UK increased its offer in response to the EU's demands over the financial settlement. Differences remain over the role of the European Court of Justice in any deal over citizens' rights, but the Irish border question is seen as the major potential stumbling block. EU leaders are due to make a final decision on whether to allow talks to proceed at a European Council meeting on December 14 and 15. Brexit and the Irish border: what are each side’s solutions?